“I do not know what is wrong with her!” said Amma. “Give her some gripe water” opined someone in the room. This incident happened sometime during the 1980s when our family was settling down in the ‘then Bangalore’, somewhere in a quiet street of Wilson Garden. Back then when the greenery was at its lust best and the weather was that of a hill station’s things were a lot different in this city, but for one person. Appa was entering the house after a long tiring day at work; he was working as a clerk in a bank back then. While he was at the door and was about to remove his shoes, he heard the hullabaloo. He looked around and saw his little daughter in her mother’s arms turning apple red and restless, crying like the world has come to an end. I must have been around eight months old. His heart must have twitched, and how am I so sure about it now, well I shall explain that later. What happened after that is a hilarious anecdote recited in our household even today. Only a father could do such a thing, and when I ask or tease Appa about it now he gives me the widest grin. Seeing me cry he rushed in with his shoes on and snatched me literally, while everyone could do nothing but look at him rush out. Amma enacts it quite dramatically anytime we ask for, like it happened just yesterday. Within a moment he was gone, running out in the street. He returned in the night having tried everything to console me, our favourite spot was a medical store named ‘Bharat Medicals’, not knowing what is wrong with me he would take me there thinking some medicines might help. But finally I would end up sitting on the counter, looking at the vehicles and passer bys and playing with the shopkeeper which somehow worked according to him! That day it so ended up that I had a bad ear infection, so the doctor diagnosed after a consultation which happened after he returned back home with me. 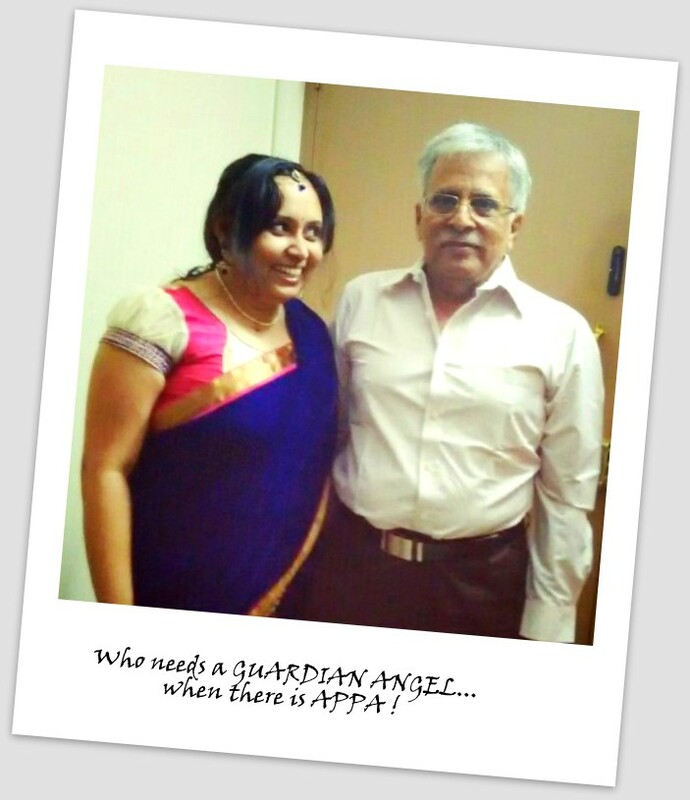 More than any poem or mantra, I have heard this from Appa. Some relationships are a blessing, you would have never asked for it but still they turn out to be one of the best things in your life. Having a father who treats you like a princess all the time in all the places and also expects others to treat you so maybe is one. But having a father who treats you like you are his world, well that is God sent, sans pareil. Anyone who knows our family knows about me being his total darling, people do pull his leg about it but he is proud about the same. What we as father and daughter share is beyond this post. 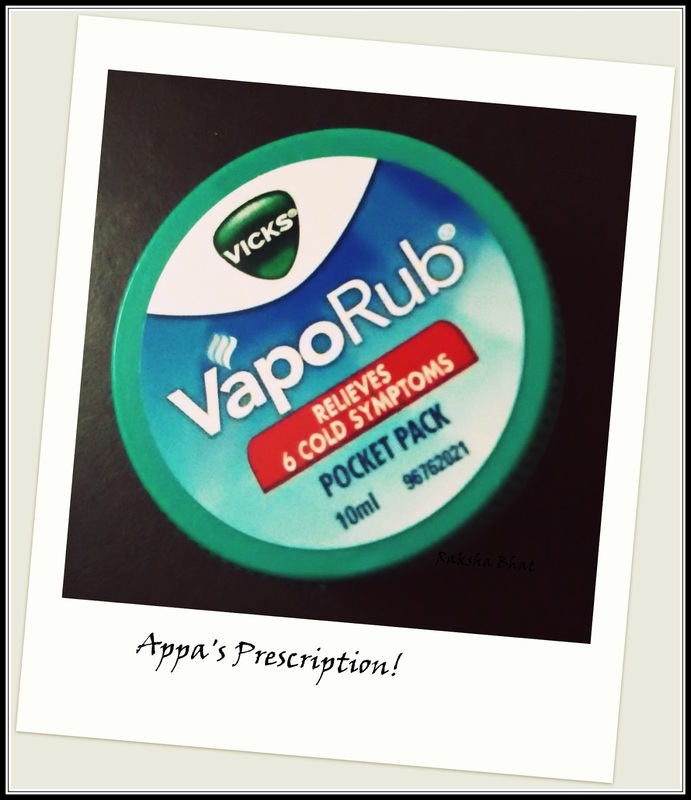 We have our moments; happy, sad and the usual like everyone else but today inspired by this prompt by Vicks and Blogadda, with a thought about what might be his reaction I hugged Appa in the morning as soon as I woke up. He was sitting on the sofa with the lights off and I was at my ‘running nose’ best rubbing my nose on his tee, the early morning allergic rhinitis episodes that I usually have. Believe me it was magical, it really did take me down the memory lane. He is a retired man in his sixties now, very young at heart doing everything possible for his daughter. "You are a doctor now, why don’t you take care” he scolded. Adorable! Ain’t he? I am going to give him a special hug this Father’s Day and every day. 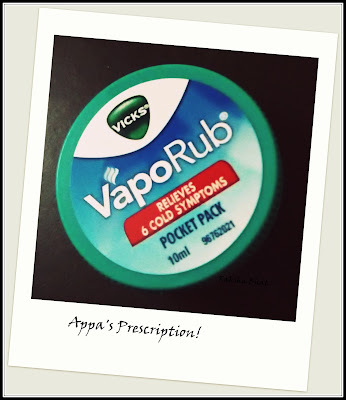 His heart does twitch when I am not well even now, and his prescription for his daughter who is a doctor always does include ‘Vicks’. Some joys of life are given to heal and feel. 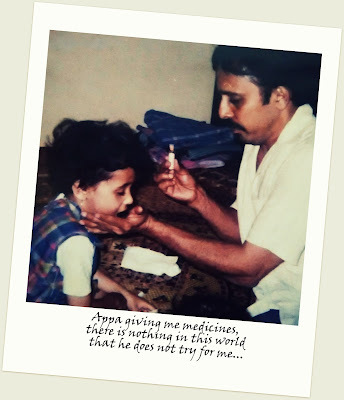 PS:“This father’s day, I am expressing my love towards my dad by participating in the #HugYourDad activity at BlogAdda in association with Vicks.